Oaxaca Google Maps and common sense conspire on Mexican highways to eliminate your choices when the signs driving to Mexico City or Puebla or Oaxaca say either Cuota or Libre, essentially toll road or free road, especially when in this case “libre” means an extra thirty to sixty minutes on the road, if you are both good and lucky. Once on the cuota road there are few more disheartening signs on the Mexican public highway system than caseta de cobro meaning a toll both is ahead. Driving on these roads between Mexico City and Oaxaca we found none cheaper than $1.50 USD and some stretches as high as $6.00 USD, making the New Jersey or Oklahoma turnpikes look like pikers. My guess is that we paid at least $25 in tolls over the seven hours on the roads, though my companera claims it was closer to $50. It is important to keep this ticket because it will be your insurance while traveling on the toll road. If you crash, or are involved in an accident, your toll receipt will help you avoid paying road repair and maintenance charges. Also, if your car should break down, your ticket covers roadside assistance. The roadside assistance is provided while driving on the toll roads by the Green Angels, which are the Mexican equivalent of the AAA in the United States. The roads are built to US interstate highway specifications, and driving through the southern Sierra Madres, I couldn’t help but notice how magnificently the twisting curves had been engineered. Nonetheless, the real story of these highways is the story of neo-liberalism and financial shenanigans of the worst kind where the front-end cost to the Mexican government is paid by bonds to private banking institutions in other countries mortgaged with up to fifty years of these payments. As the promotion for these PPPs, worldfinance.com notes, “Lenders normally come from major Europe-based international commercial banks – with France and Spain especially well represented – as well as Asian banks, particularly from Japan and South Korea.” Depending on your perspective, Mexico is either the poster child or the horror story of the wave of private-public partnerships that have been the hallmark of neoliberalism. In a case study included in the paper (see below), the conclusion is inescapable: securitization makes these projects vastly more expensive with the public paying the price. Usually driving at your own risk is just a caution to keep your eyes on the road, but public-private partnership on Mexican highways should come with an additional warning sign for the public to make sure their hands are not just holding the wheel tightly, but also their pocketbooks. The Tenango-Ixtapa de la Sal highway is a state highway located in the south of the State of Mexico, running for 40 kilometers. The concession opened in December 1994, and was initially awarded to the company Tribade, a subsidiary of Promotora y Operadora de Infraestructura (PINFRA) (formerly known as Triturados Basálticos, Tribasa). In 2003, PINFRA ceded the concession to its subsidiary ATISA. Two years later, on August 23, 2005, ATISA liquidated the obligations it had acquired from the Banco Nacional de Obras (Banobras) and was able to set up as an issuing trust for the highway. 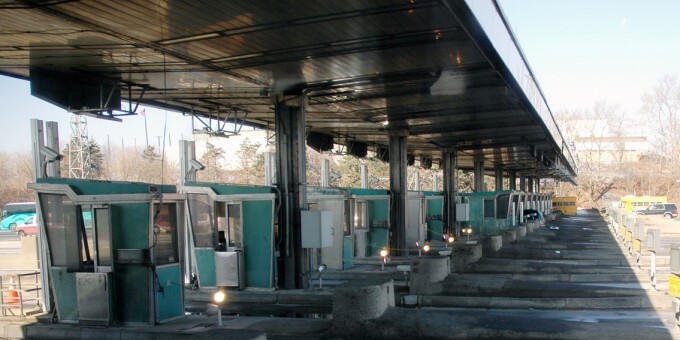 The companies Pinfra Sector Construcción (Pinseco) and ATISA established a stock certificate issuance program backed by the toll-collection rights for the highway. ATISA is the concession operator for the Tenango-Ixtapa de la Sal project, but Opervite performs operations. Both are subsidiaries of Pinfra. So there is a revenue stream on toll fees coming from the highway, which support the stock issuances. It is important to mention that the State of Mexico government receives an amount equivalent to 1.5% of the gross monthly income (excluding VAT) generated by the highway as part of the concession. On the other hand, Pinfra is one of the leading companies working on infrastructure project development in Mexico. The company has 16 road concessions and a port terminal. The former include 25 tollways and a bridge. Moreover, it produces asphalt and additives. In 2015, Pinfra operated a length of 989 roadway and bridge kilometers driven by 58.8 million vehicles (Pinfra, 2014: 16). In 2014, nearly 70% of Pinfra’s revenue was derived from the transportation infrastructure concession division. The rest of its revenue was from its own operations in the construction branch. 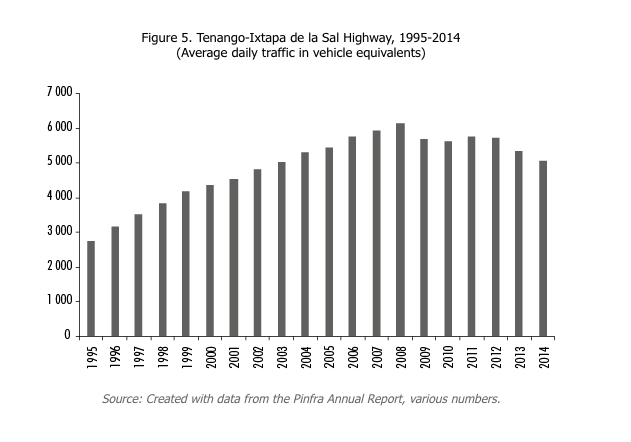 In particular, the Tenango-Ixtapa de la Sal highway contributed 2.2% of its total income. Pinfra has five securitized highways,10 which account for one third of its income. It becomes clear that these financing schemes are intimately bound up in the company’s high profitability. In 2014, operation and maintenance costs per kilometer of Pinfra’s securitized highways were nearly double the costs for the non-securitized highways it operates. This is a sign that securitization raises the financial costs for companies who hold road concessions. For at least the last five years, Fitch Ratings has rated ATISA issuances AA+ (very high security) with stable prospects, considering factors such as traffic and income performance, additional traffic, structural strengths, and the nature of the highway. This rating is granted in spite of the fact that vehicle traffic on the highway has fallen over the past five years (see Figure 5). In short, the case of the Tenango-Ixtapa de la Sal highway demonstrates that PPPs that enlist asset securitization have not been efficient. On the contrary, companies seek to manage more public assets so that the scheduled profits on the project will materialize, at the cost of user income. In other words, private does not make public more efficient. If it’s securitized, it actually makes it more expensive. This entry was posted in Ideas and Issues and tagged mexico, neoliberalism, securitization, toll roads by Wade. Bookmark the permalink.